As good an opportunity to catch a trophy yellowfin as we have seen anywhere. One fish at 211 in the early am led to a long day of poking and prodding as we explored new ground and got a feel for this zone. By late afternoon while still prospecting mast man/Captain Blake Wasano eagle eyed exactly what we were looking for. Two different big spots of huge yellowfin were up on the surface chasing fin bait well within striking distance. The first spot disappeared before we got on it. The second spot sank out also but the trusty sonar pegged them and the rest was history. Once on top of them we hit it long range style. The result was nothing short of astonishing. 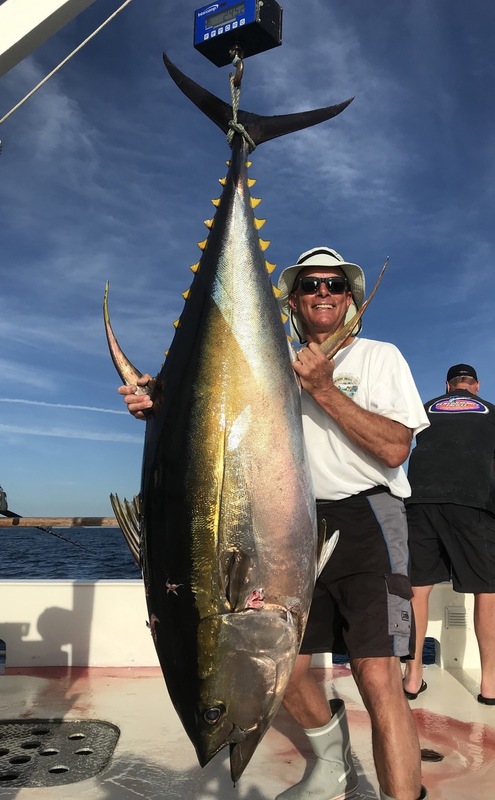 Huge yellowfin absolutely detonated mere yards from the stern filling the circle with cavernous boils and epic acrobatic displays. The sight was breathtaking. Wow. Then the fishing/catching began. It took a few minutes for them to get going but get going they did. Text book long range style action on straight cows for two and a half hours. The end result was 6 fish over 200 and another couple of three “smaller” 190’s. What a stop. After that result it’s safe to say the potential we envisioned in this brand new enterprise was fully exposed. Now it is time to build on what we started. Captain Brian Sims heads out again tomorrow for the second four day run. Using less than a third of the bait on board this run it’s safe to say tomorrow’s group is in fantastic shape to make the most of any and every opportunity that may arise. The guys have absolute grease calm weather in the forecast so we’ll see if they can make it happen. Again, everything else aside, it is still up to the fish God’s. In closing I have to extend my personal thanks to this group of anglers who took the leap of faith needed to launch new ventures. Their adventurous nature and faith in our ability lead to an opportunity of a lifetime. Their’s was a risk richly rewarded. Photo honors today go to Let’s Talk Hookup representative David Dolan who got us started in the afternoon with this fine 215.